6. Arthur Albert SMITH was born on 28 Nov 1883 in Cary, McHenry, Illinois. He died on 17 Aug 1934 in Chicago, Cook, Illinois at the Illinois Central Hospital. Funeral services for Arthur Smith, who passed away early Friday morning will be held Monday afternoon at 2:30 at Wiese and Tempel funeral home and burial will be made at Oakland. Wilbur T. Vipond will be in charge of arrangements. Friends may pay their last respects at the home of Mr. Smith's daughter, Mrs. John G. Feld, 918 East Clinton street, where the body was taken yesterday when brought from Chicago. Word received here yesterday morning of the death of Arthur Smith brought sorrow to a large number of friends and employes of the Illinois Central railroad, with whom he had been associated for the past twenty-two years. Mr. Smith had resided in Freeport until two months ago, when he moved to Cicero. Although in ill health for the past two years, he only entered the Illinois Central hospital in Chicago a week ago, passing away Aug. 17. Arthur Smith, son of Mr. and Mrs. John Smith, was born in Cary, Ill., Nov. 28, 1883. He was united in marriage with Edith Smith in 1905, and her death occurred in 1919, leaving three children, Mrs. Viola Feld, and LeRoy Smith, Freeport, and Laverne Smith, Sterling. He was married in 1921 to Mrs. Helen Mosmen, who survives as does his mother, Mrs. John Smith, of Cary, a sister, Mrs. Alvina Melahn, of Dundee, and two grandchildren, Edith and Barbara Feld. The deceased was known as a conscientious and loyal worker for the Illinois Central, Wisconsin division. In his earlier years he was employed as a fireman and later became an engineer, well known and well liked. Through ill health he was forced to give up his work for awhile but about six weeks ago he resumed his duties as engineer. He was a member of the Brotherhood of Engineers. A pretty wedding occurred at the home of the Groom's parents, Mr. and Mrs. John J. Smith, in Cary, Ill., Thursday, Jan. 26, 1905, at which time and place Miss Edith Smith of Nunda and Arthur Smith of Cary were united in wedlock, the ceremony taking place at 5:30 in the afternoon, and Rev. Stanger, the German minister from Barrington, officiating. The bride was gowned in brown silk, and carried a bouquet of carnations. The residence was decorated in pink and white carnations. The bride was attended by the groom's sister, Miss Laura Smith, and the best man was Arthur Mengerson of Chicago. Only immediate relatives and friends witnessed the ceremony. Congratulations were extended to the bride and groom and a bountiful wedding supper was served. The young couple then taking the train for Nunda amid a shower of rice from friends. Friday they left for Genoa, where they visited until Tuesday, returning to Cary, where for the present they will make their home with the groom's parents. Both young people are well known in Nunda and Cary, and their friends are numerous. None but the kindest wishes will be given them, and every acquaintance will join the Herald in the hope of long life, happiness and prosperity for Mr. and Mrs. Smith. 7. 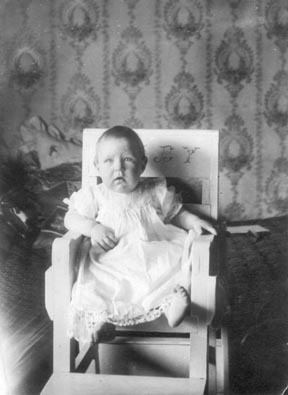 Edith SMITH was born on 7 Aug 1884 in Nunda, McHenry , Illinois. She died on 22 Jul 1919 in Freeport, Stephenson, Illinois. Mrs. Arthur A. Smith, Douglas Street, Expires. Young Woman, Ill Two years, Passes Away Yesterday. Mrs. Edith Smith, wife of Arthur A. Smith and a resident of Freeport for the past six years, died at her home, 50 Douglas street, at 2:30 o'clock yesterday afternoon. She had been ill about two years with tuberculosis. 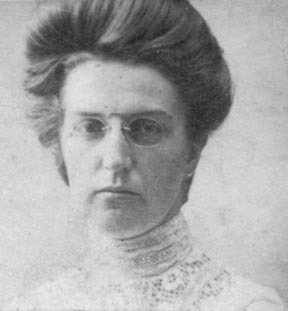 Mrs. Smith was born at Crystal Lake, Ill., August 7, 1884 and was married in January, 1904, to Arthur A. Smith. The family moved to Freeport six years ago. The husband and three children survice. The latter are: Viola, LeVerne and Leroy Smith, all at home. (Several obvious typos - Married in 1905, not 1904 - survive, not survice - LaVerne, not LeVerne). She was buried in Cary, McHenry, Illinois. Body was moved to Oakland Cemetery in Freeport sometime around 1934 to be next to husband, Arthur. Viola (Smith) Feld identified body for this purpose. She had been ill with tuberculosis for about two years. Circa 1908. John Smith's 155 acre dairy farm on Crystal Lake Road, north of Cary, Illinois, east of Silver Lake. 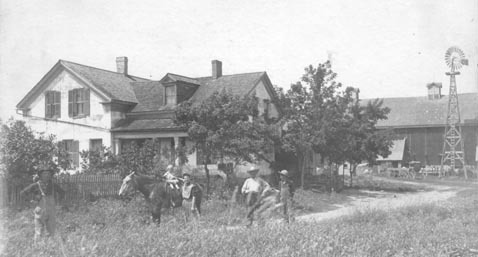 Son, Arthur who at the time of this photo ran the farm, stands in the left foreground. His wife Edith stands next to their daughter, Viola, who is sitting on the horse. The other two people are unidentified. Today this house and barn no longer exist, but the present house and shed appear to have been built upon the old foundations. Deer Path School has been erected on the south 80 acres. ii. LaVerne SMITH was born in 1910. He died in 1975.
iii. LeRoy A. SMITH was born March 1, 1914. He died March 14, 2004 in Freeport, Stephenson, Illinois.